Today’s shop update day. Shop away at 2 pm EST. Um, this one’s a big one. In addition to the fiber club, I somehow managed to dye an awful lot of fiber and yarn, including some new ones. There’s hand-dyed wool/ soy silk fiber (shown above), and a DK weight alpaca yarn. The sad news is, there isn’t any Fat Sock this time, as it’s been back-ordered a painfully long time and I’ve finally run out. I did sub in a DK weight superwash wool that will knit up into lovely machine-washable winter socks. 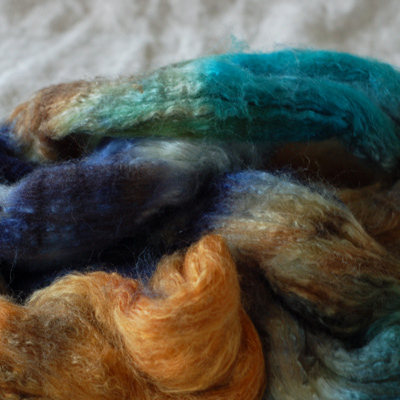 I’ve also dyed up Wensleydale, Merino, 18 micron superfine Merino, and Bluefaced Leicester wool spinning fibers. Sarah from Maisy Day Handspun sent sock, handspun 2 ply (!!!) and handspun thick and thin yarns. I had been planning to give myself a bit of a raise starting today, but it turns out that any price increase I had planned is now going to go to materials, since my main supplier’s prices went up. So, expect to see a bit of difference in prices from now on. I won’t need to raise them again for quite some time. October’s fiber club offering will be shipping this week. I’ve been spinning it for the last couple of evenings. It’s great stuff and I hope everyone enjoys it. On Wednesday, the club will open up to new members. Returning memberships are for sale now. Those are such beautiful colors! The fibers look so soft and I cant wait to see the alpaca yarn! just wanted to let you know there is an errant “y” in the url of the shop link in the post. Will you have more of the gorge colorway soon? Love it!